While no security vendor can stop zero-day malware from entering your network, Comodo can prevent you from becoming patient zero. Conventional and automated next-generation security solutions rely on detection and therefore, will not detect unknown threats. Their solutions run on Default Allow platforms. This is risky because by default, they “allow” any file they don’t detect unfettered access to your endpoints, including unknown malware. In contrast, Comodo’s Default Deny Platform runs a default deny posture that prevents unknown files (zero day) from accessing the host. Instead, they run in a lightweight container—CPU-enforced OS Virtualization—on the endpoint with negligible impact on performance. Comodo’s Secure Auto Containment™ prevents infections from new malware. Only Comodo can deliver maximum security and usability with a Default Deny posture that prevents infection and the resulting damage with Secure Auto Containment combined with extensive detection and response capabilities. Comodo Secure Auto Containment™ provides full endpoint protection by creating a secure container (sandbox) where all unknown files or applications can be used and analyzed. While the unknown file is in the container, in CPU enforced OS virtualization, users can run the file or application safely until Valkyrie, Comodo’s cloud-based analysis system delivers a trust verdict of good or bad. Good files are allowed to run on the endpoint and bad files are eliminated. Threat intelligence (first signature) is shared immediately across the enterprise to prevent infection at other threat vectors. As well, signature lists—application whitelisting and malware blacklisting—are dynamically updated as trust verdicts convert unknown files to known. Comodo OS virtualization technology is extremely lightweight, has no CPU dependencies and is completely application agnostic. Malware or any other unknown process entering this virtualized environment cannot modify the hard disk, registry, or COM interface; therefore, containing any unknown risk. 100% compatible with old or new CPUs, whether the user is on or off the corporate network. Along with Secure Auto Containment and Self Protection, the Host Prevention Intrusion System (HIPS) is another layer of defense that makes up Comodo Advanced Endpoint Protection. Comodo Advanced Endpoint Protection provides several levels of Host Intrusion Prevention, incorporating signature, baseline and stateful inspection to prevent malware from executing in the enterprise environment. The HIPS layer looks for deviations from normal or baseline states in bandwidth, protocol usage and ports. Stateful inspection provides visibility of the actual protocols contained in the data packets traversing the network and endpoint. If HIPS detects an abnormal state, it alerts the user or administrator and follows a predetermined set of actions to prevent the endpoint from being compromised. 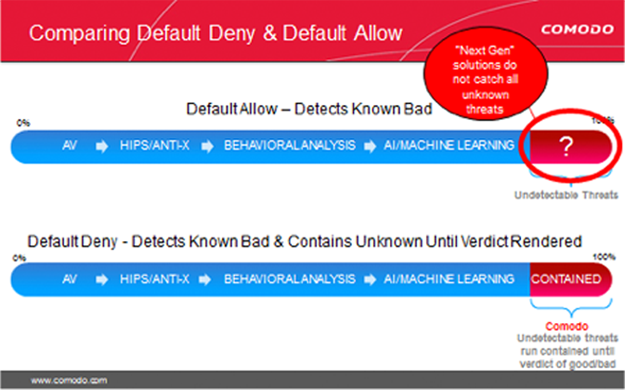 In addition, Comodo also does behavioral inspection with our host intrusion prevention system (HIPS) in conjunction with behavioral analysis / AI / machine learning feature sets at the endpoint and in the cloud. This is needed to identify Advanced Persistent threats (APTs) that may contain routines that attempt to determine if they are in virtualization (a sandbox) or check for fingerprints of specific security vendors’ sandbox environments. If the APT code detects a sandbox, it won’t run its malicious execution path and can persist. Since the default allow posture is the underlying problem, we need to flip an organization’s overall security posture to Default Deny to eliminate malware threats. Comodo’s breakthrough security allows the known good, blocks the known bad and contains the unknown until a verdict can be determined. Productivity is assured, and no malware runs on your endpoints. Your endpoints are 100% malware-free with a viable Default Deny Security Posture. You can manage and protect any device, whether it’s on or off your company network with Comodo™ Advanced Endpoint Protection. Your enterprise security solution will be rendered useless if it can’t protect itself against critical process termination. Malware authors know this and will try to disable security to enter your environment. Viruses and Trojans (ransomware) often try to disable your computer's security applications so that they can operate without detection. Comodo Advanced Endpoint Protection secures its own registry entries, system files and processes so malware can never shut it down or sabotage the installation. 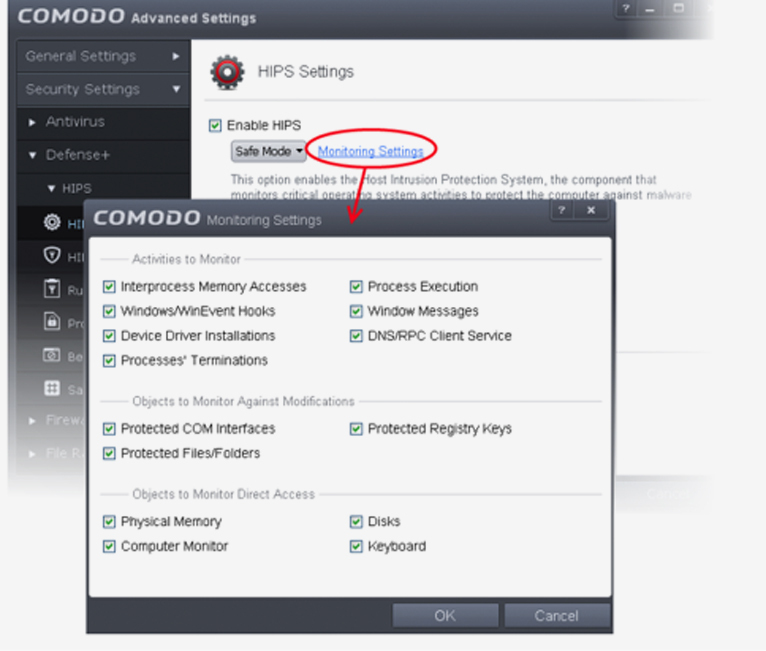 Comodo Advanced Endpoint Protection has the strongest "Self-Protection" of any security software, providing continuous protection of itself as well as the subsystem it relies on, as well as constant monitoring and protection of the operating system and all trusted applications.